Nothing completes an outfit quite like an awesome pair of earrings or a striking necklace so we’ve scoured the trends and the designers to bring you some gorgeous jewelry to incorporate into your wardrobe this fall. We have everything from delicate necklaces and earrings to seriously edgy pieces. Faux jewelry may not be the fine stuff, but who cares when you have options as great as these? Click through to see what we’re excited about. 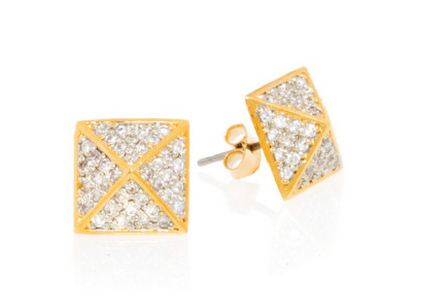 Update your look and wear these these edgy chic pyramid studs instead of your diamond studs. They’re glitzy and glamorous but subtle enough to mix well with other statement accessories, like chunky or layered necklaces. From Rebecca Minkoff’s recent line expansion into jewelry comes this modern and edgy piece. 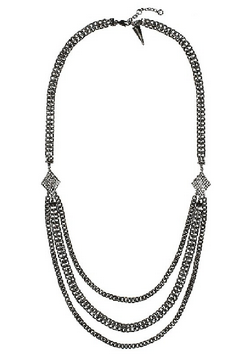 Offset this awesomely intense layered gunmetal necklace by pairing it with feminine silhouette.